Over the years, the diameter of hair becomes thinner and weaker. 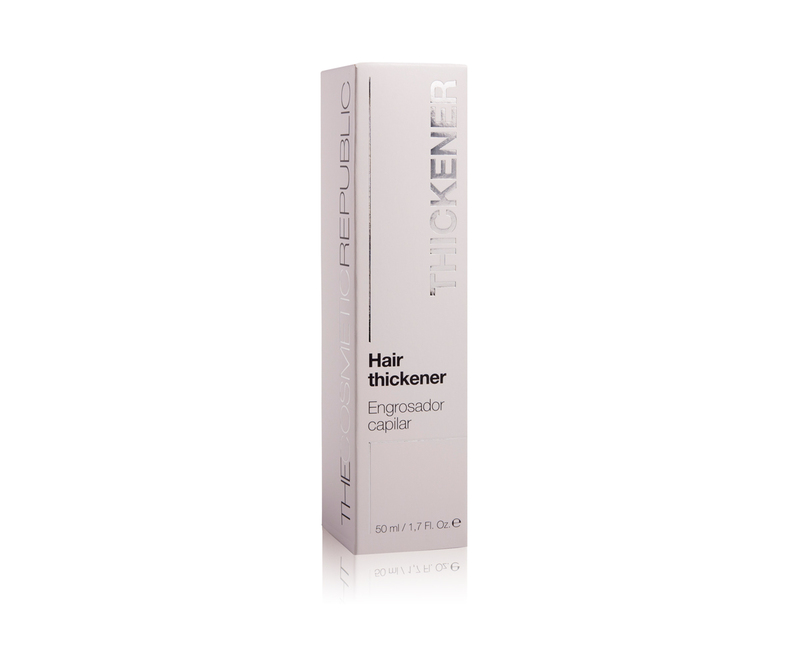 This Hair Thickener that defies time, restores and maintains a healthy hair appearance providing more volume to hair. A weightless lotion that will thicken the appearance of hair to create the feeling of movement and body. Fuller, shinier and healthier looking hair in 1,2,3. 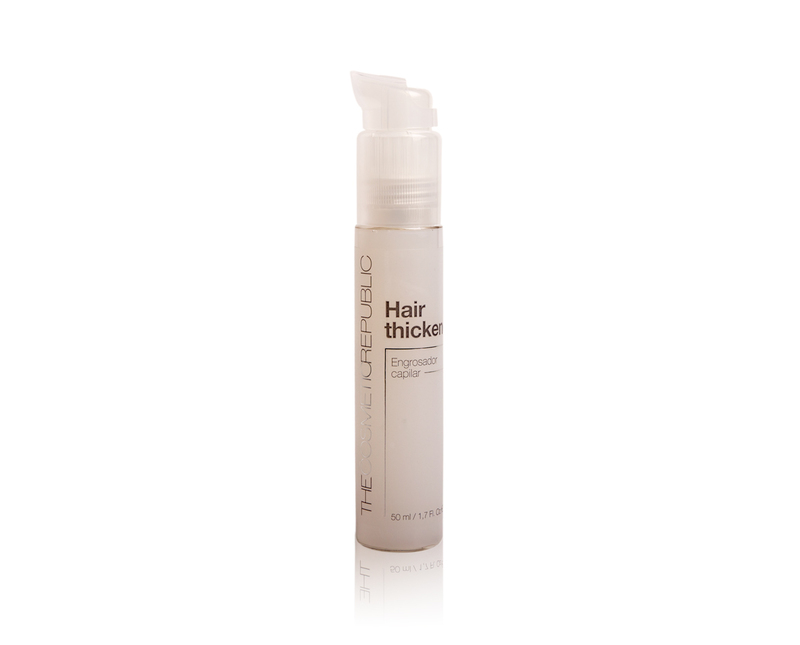 It transforms and volumizes fine hair from lifeless to lively, adding volume to fine limp hair. Infused with selected ingredients to bring back body, shine and manageability for healthy-looking hair. This unique Hair Thickener has been specially developed for the daily care of poor weak hair with no volume. Contains keratin microspheres and B3 vitamins providing shinier, smoother and fuller looking hair to create a noticeable difference. Get an instant expansion and long-lasting body. Its exclusive blend of selected ingredients moisturizes for touchable, shiny hair without stickiness, thickening each individual strand for instant expansion and long-lasting body. Indicated for all hair types. Cold pressed. Paraben & sulphate free surfactants. Color safe. For men & women. NOTEs: Apply 1-2 drop from roots to tips on wet or dry hair. Do not rinse. Water, Alcohol Denat, Fragance, PEG/PPG-20/6, Acrylates/C12-22 Alkyl Methacrylate, Copolymer, Niacinamide, Panthenol, Polyvinyl Alcohol, Acrylates/C10-30 Alkyl Acrylate Crosspolymer, Triethanolamine Phenoxyethanol, Hydrolyzed Keratin, Keratin, Propylene Glycol, Ethylhexylglycerin. Apply 1-2 drops on wet or dry hair from the root to the ends. Blow-dry and style as usual or allow hair to dry naturally. If used together with the anti-aging, use it first and after a couple of minutes apply this Hair thickener. Say bye to tangles! Keratin Brush is the exclusive tool created by The Cosmetic Republic to detangle all hair types without efforts. With more than 400 ergonomic & flexible 3D bristles, Keratin Brush is able to brush even the most unruly hair without pulling or breaking it. A new fast & easy hair styling concept pampering your hair everytime you use it, favoring your natural’s hair shine.